My brother turned to me in the theater right before the movie started and whispered, "Man, that was a lot of science fiction trailers." Though he hadn't intended to, that one sentence left my attention split between the movie I shelled out 10 bucks for and the pop culture implications of the movies coming out this year and why some might resonate more than others on a conceptual basis alone. While all of these movies will eventually stand or crash horribly on the merits of the people involved, the purpose of the trailers is to generate buzz and therefore sell as many opening weekend tickets as possible. While there are plenty of people who put their ears to the ground, research the history leading up to the films, and follow Hollywood politics like it had it's own 24 hour news network, I'm going to address these movies from a cultural perspective with not much more knowledge about their inner workings beyond a few names and what I saw in trailers. 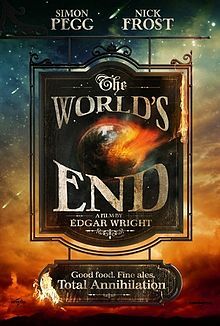 I predict movies about the apocalypse will do as well as how “fun” they seem. Slow, contemplative dramas about the collapse of civilization can be great, but I suspect with another year of money being tight and lots of people feeling like the world is already going on the edge of collapse, there will be more people who will want to see heroes saving the day rather than mourning the losses. My bet is “The World’s End” with Simon Pegg and Nick Frost will win out over “After Earth” with Will Smith. Big, dumb action movies with their bigger and dumber sequels always do well, but this year my gut says that the big dumb action movies with some science fiction will do the best. Our technology is always evolving, but with the tantalizing questions that things like Google Glasses, SIRI, and SpaceX bring up, this year a lot of people will feel like perhaps our technology needs to evolve a bit faster. Maybe this was a prescient move by Hollywood execs to release Pacific Rim, Iron Man 3, Elysium, and Star Trek: Into Darkness all around the same time, but it’s probably just an odd coincidence that will seem deliberate if the more straightforward action movies like GI Joe, Die Hard, and Fast and Furious don’t do as well. Lastly, Hollywood seems to be making some progress in regards to gender as they’re staking a lot of money and cranking out a lot of movies aimed at the female demographic that have some more variety beyond “another boilerplate romantic comedy”. While I couldn’t tell you which supernatural romance will succeed at filling the space Twilight left, when the fight is between Hunger Games, The Host, Beautiful Creatures, and The Mortal Instruments, the fact that the options are there is probably a pretty good thing, and will hopefully end the rest of the “BOYS ONLY” elements that still exist in geek culture. Needless to say, I wouldn't mind if Warm Bodies beat out World War Z as the zombie movie of 2013. Oh, and have you heard of “The Heat”? It’s supposed to be a buddy cop action/comedy with Melissa McCartney as a loose cannon cop who doesn’t play by the rules getting paired up with Sandra Bullock as a by-the-book FBI agent, and it’s all being directed by the same person who made “Bridesmaids.” I'm sold.